Warning: you probably shouldn't keep reading this unless you're willing to experience extreme office envy. While the rest of the world slaves away in drab, grey-walled cubicles, the owners of this wonderful wooden workplace get to look down on us - literally. 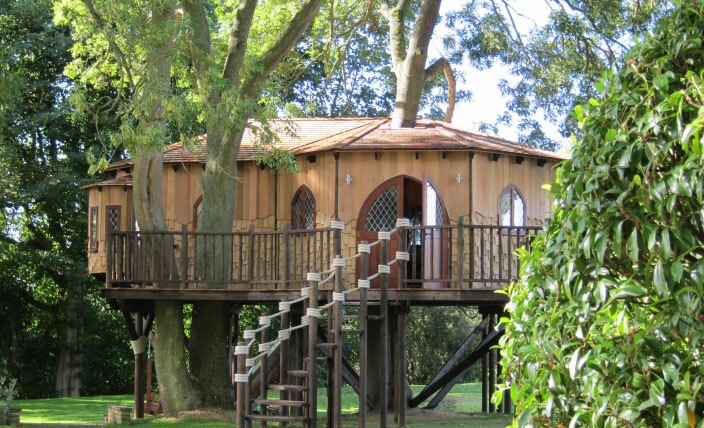 Built by Blue Forest, this luxurious treehouse may look like play on the outside, but it's all business inside. But with a fun full-sized slide staring you in the face all day, how you could make any progress on those spreadsheets is baffling to us! Located in the Shropshire countryside in England, the home has almost a Tudor feel with its pointed doors and windows. 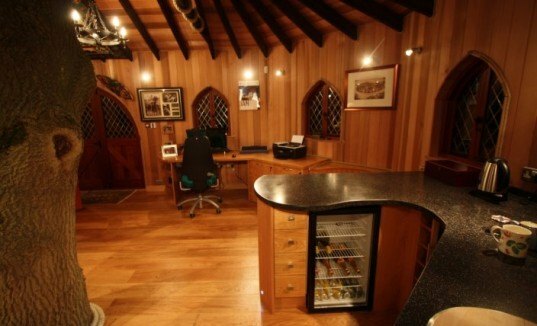 Inside, the decor is rustic but that doesn’t mean that it isn’t decked out with the latest amenities like a modern workstation and (judging from the photo) a mini fridge stocked with champagne! The large living room even has a flat panel TV in case you want to take a quick afternoon break. It looks like the only thing it is missing is a toilet and Jacuzzi bath. I wonder if they can be installed? Is that a Lexmark printer I see here? Located in the Shropshire countryside in England, the home has almost a Tudor feel with its pointed doors and windows. Inside, the decor is rustic but that doesn't mean that it isn't decked out with the latest amenities like a modern workstation and (judging from the photo) a mini fridge stocked with champagne! The large living room even has a flat panel TV in case you want to take a quick afternoon break. Although built around a tree (which you can actually lean up against right in the kitchen) this is no shack in the middle of nowhere. It has heating, lighting, broadband and phone lines - everything you need in an office.